Tool Changing Press Brakes come with stroke of 11.8 in. Available in ToolCell 220/30 Plus and ToolCell 220/40 Plus models, Tool Changing Press Brakes deliver up to 240 tons of bending force. Capable of handling bend lengths of 120 in. and 157 in., unit features integrated tool changer and tool storage system. Embedded with TOUCH-B control, products come in height of 22.4 in. 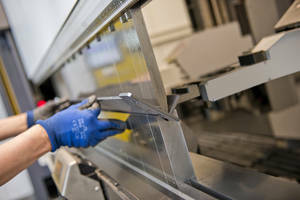 Equipped with laser scanners, press brakes uses profile LVD tooling such as 231 mm punches and 130 mm dies. LVD Strippit expands its line of ToolCell automated tool changing press brakes with the ToolCell 220/30 Plus and ToolCell 220/40 Plus. The new Plus models can handle bend lengths of 120” and 157” (3 and 4 m) and deliver up to 240 tons of bending force. They feature an open height of 22.4” (570 mm) to accommodate higher tools. The machines use the taller profile LVD tooling (231 mm punches and 130 mm dies), which allow for the bending of parts with higher flanges. The ToolCell hydraulic press brake features an integrated tool changer and tool storage system. The machine automatically selects and places the tooling required for the job. While the operator is preparing parts for the next job, the machine unloads the previous tool setup and loads the next setup, all without manual intervention. The tool storage system offers a flexible tooling configuration to suit specific application requirements. The new ToolCell Plus press brakes have a standard open height of 22.4” (570 mm) with a stroke of 11.8” (300 mm). This can be enhanced to an opening of 26.4” (670 mm) and a stroke of 15.7” (400 mm). This provides the flexibility to bend a wider range of parts, from simple to complex. The accuracy of bending operations is assured with LVD’s patented Easy-Form® Laser adaptive bending system, standard on all ToolCell models. Easy-Form Laser provides in-process angle monitoring via laser scanners located on the front and back of the press brake table. The system transmits information in real time to the CNC control, which adjusts to ensure the correct angle. The bending process is not interrupted, and no production time is lost. Using Easy-Form Laser, the machine is able to adapt to material variations such as sheet thickness, strain hardening and grain direction, automatically compensating for any changes. As a result, ToolCell delivers consistent bending results from the first part. ToolCell is Industry 4.0-ready thanks to LVD’s latest generation TOUCH-B control. TOUCH-B features intuitive graphical icons used to control all parameters of the machine, ensuring fast and efficient operation. The control is linked to a central CADMAN® database where all production-relevant data is stored. This makes a fluent, digital transfer of production data from management systems to the shop floor possible. Communication to management, planning, production, quotation, costing, and other external software modules is handled via a standardized open interface. LVD is a leading manufacturer of sheet metalworking equipment, including laser cutting systems, punch presses, press brakes, guillotine shears and mid-level automation systems, integrated to and supported by its CADMAN® software suite. LVD Industry 4.0-ready products and technology make smart manufacturing possible.